The art exhibit at Oak Ridge Public Library for the months of April and May consists of a variety of works done by The Arty Group. 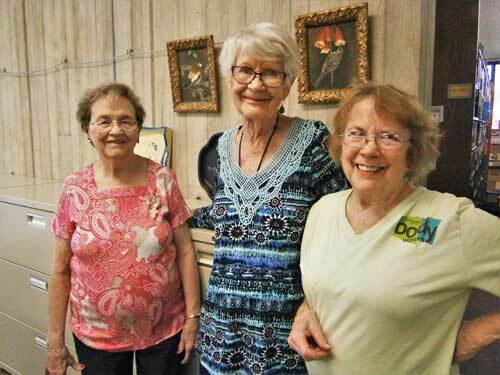 The original group began in 1968, when several members were taking art lessons at the YWCA. They decided to continue meeting and painting together. The main goal of The Arty Group is to paint, inspire and encourage each artist. Past projects of the group include a nine block quilt to commemorate Oak Ridge’s 50th anniversary in 1992 and an appointment calendar featuring original paintings. The Arty Group continues to meet in private homes or travel to paint on location. They have ventured to Nashville, Chattanooga, the Blue Ridge Parkway, and other local areas for artistic inspiration. Exhibiting this year are Ouita Northcutt, Betty Waters, Nancy Fox, Polly Keck, and Pat Thompson. Each artist works in a different medium and with a distinctive style. Landscapes, portraits and flowers are featured subjects of this exhibit. The works are created in acrylics, watercolors, oils, pastels, and colorful collages. One piece is an award-winning oil painting entitled Shells by Polly Keck. 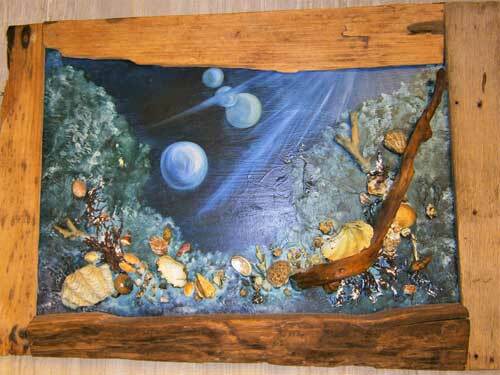 This painting won second place at the Anderson County Fair and is a stunning three-dimensional nature study. Betty Waters demonstrates two whimsical décor items crafted from milk bottles and paper cups. Please come by and enjoy this exciting art show at Oak Ridge Public Library during the months of April and May.